Heading towards your destination, but too much traffic along the way? For your entertainment and just so that you don’t get bored in the horrid traffic, the cab services in India have found out a better way to keep their customer satisfied and entertained. For your comfort, on your way towards the destination you get to use the Wi-Fi service now being provided by them. 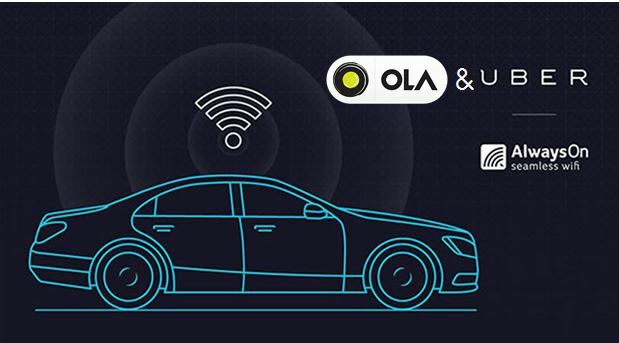 Uber has apparently entered in a partnership with ‘Bharti Airtel’ to bring in free in car 4G Wi-Fi for the customers. The company aims to provide the facility in all the 18 cities where it provides its services, some of them being- Delhi, Mumbai and Bangalore. The above can actually lead up to Uber creating a firm position in the Indian market and will escalate the company’s growth. But this isn’t all, the organisation has also announced about the benefits for the drivers in the press release. It is providing cell phone plans for the drivers at discounted rates and has started accepting payments using Airtel Money, the mobile payment platforms of the cell phone carriers. On the other Hand we have Ola Cabs who is also the chief competitor of Uber cabs. Ola Too has come up with the similar idea but only on reward basis. It will provide a reward to the top users in the form of free car Wi-Fi. This is just a part of Ola’s select programme that will provide offers to the customers with partners like Myntra. This has certainly heightened the hopes of all the customers and will help the cab services reach a new level. And seeing the sheer amount of traffic in India, an internet connection in cabs has, needless to say, come as a rescue.